Dental Implant - Poncz Dental fogászati rendelő és precíziós szájsebészet. The state of the art solution for tooth replacement. When teeth are missing, chewing power diminishes and may even cause gastrointestinal illnesses. Over time, adjacent teeth may drift into the gap created by the missing tooth and cause other teeth to protrude from the jawbone. The teeth may become loose, no longer fit together properly and the chewing function becomes inadequate. Dental implants are the perfect solution for replacing missing teeth. 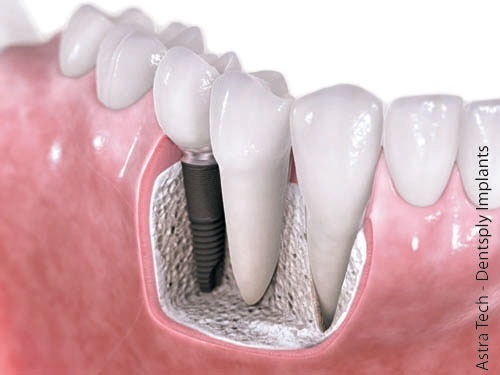 A dental implant is an artificial tooth root made of pure titanium. The artifical titanium root is implanted in the jawbone in the exact spot of the original tooth. Afterwards a prosthesis is placed on the implanted artifical root. This procedure is now a routine, completely painless intervention carried out under local anesthesia at an ordinary dental clinic. – The procedure can be carried out for one missing tooth, or in case of an edentulous jawbone. – Dental implants are aesthetically pleasing and perfectly comfortable. The first step in dental implant therapy is a discussion, followed by a thorough dental examination. The jaw is x-rayed to check the condition of the bone tissue and to determine the placement of the dental implant. We build our treatment plans to fulfill all our patient’s needs and in accordance with the results of their dental status evaluation. Our clinic uses the Astra Tech, Ankylos and Alpha-Bio implantation systems. For patients with insufficient bone quantity, the latest techniques make it possible to do bone grafting. This is a completely painless, routine intervention that provides long-term aesthetic results. When the bone quantity at the location of upper molars is insufficient for placing an implant, this surgical intervention can create the necessary bone volume. The sinus lifting procedure often makes implantation possible for cases previously not considered implantable. The advantage of this procedure is that the implant has optimal placement which ensures a long survival rate. The intervention is carried out using a surgical template so that the implant can be placed in the exact spot of the original tooth, and avoids damaging anatomic structures. In this case, any necessary tooth extraction and implantation take place at the same time, and the permanent prosthesis is prepared in a shorter amount of time. For patients who prefer treatment under general anesthesia, we provide you with the possibility. In this case, the intervention – after completing all the necessary examinations – is carried out in co-operation with an anesthesiologist.